Naturally, carrot vegetable juice has a refreshing sweet taste and is rich in pro-vitamin A or beta-carotene content. This mineral has been proven through various studies to be able to prevent various types of dangerous cancers. In addition, processed carrot juice has benefits to maintain eye health. Of course the juice taste will be more delicious if mixed with green apples that are rich in fiber. While cinnamon sprinkles will make this healthy drink more creamy like fruit smoothies. The sweetness of carrots comes from natural nutrients in which Carrots are a type of vegetable that is often used in various recipes and fresh drinks. How to process carrots into healthy ice juice drinks can be mixed with typical poor green apples like the following delicious dishes. As for the mixture of other ingredients, you should see various carrot juice recipes in this article. The article also features 10 benefits of carrot vegetables for health. If there are no green apples, you can replace them with yellow or even red apples. After all, the taste of the juice that will be made is not reduced, it is still sweet, fresh, and delicious. The combination of carrot mixed with apples is rich in important minerals such as malic acid to remove impurities (free radicals) in the body and bind toxic metals carried by fast food intake. Pectin which acts as an absorbent of excess water in the intestine while helping to facilitate defecation (BAB). Some other minerals are iron, phosphorus, sulfur, calcium, magnesium, potassium, and folic acid. Coupled with vitamins B, C, E and K, it makes the processed carrot juice more complete, healthy, and certainly delicious to drink. Wash thoroughly then slice small (dice) carrots and apples to break easily. Put it in a juicer or juice extractor. Add a little boiled water, the process until the juice comes out. Pour into a serving glass then sprinkle cinnamon powder to make the juice more creamy. 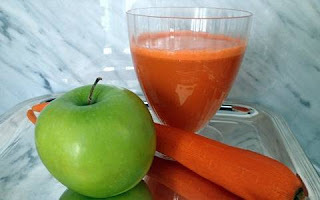 Prepared apple carrot juice is rich in fiber and pro-vitamin A, the purpose of which is to prevent the emergence of cancer while maintaining eye health.